Our third visit to Morocco was wonderful. 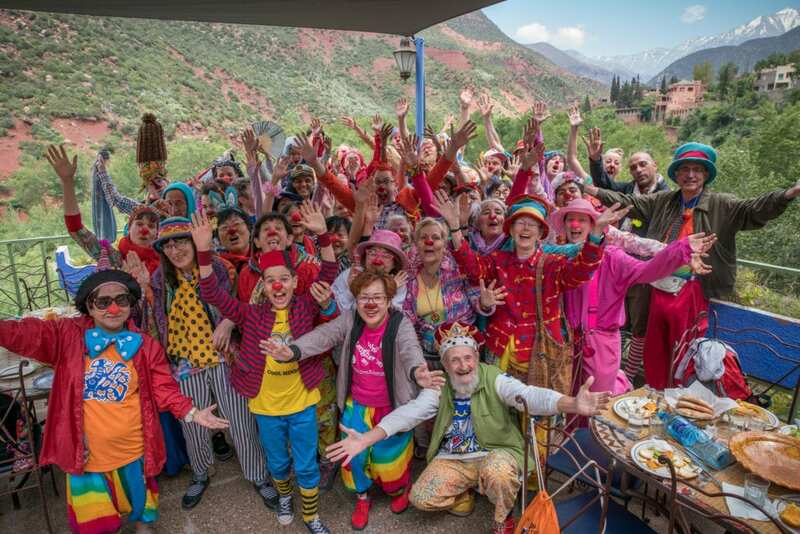 We had a group of nearly 50 clowns and were welcomed warmly both by our hosts in Morocco and the Moroccan people. From the medinas in Marrakech to the coasts in Casablanca we took Morocco by colorful storm. 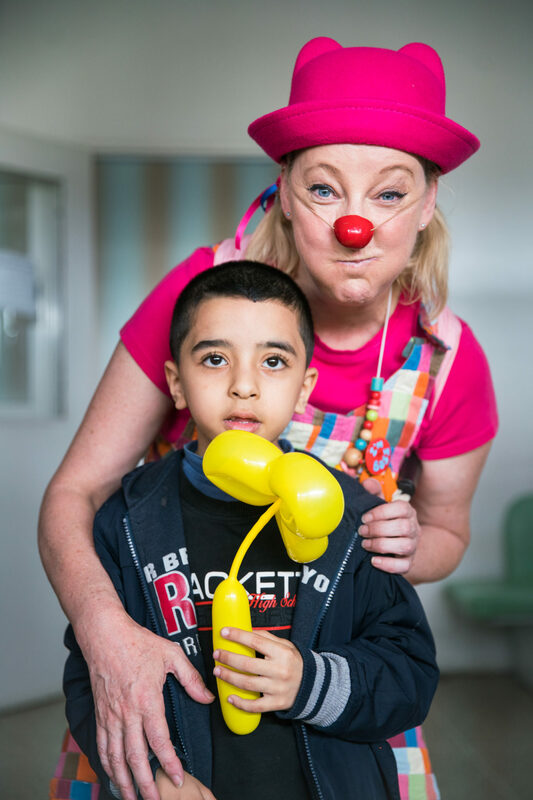 It is a wonderful thing to be able to go to a country where we have close clown friends and family. 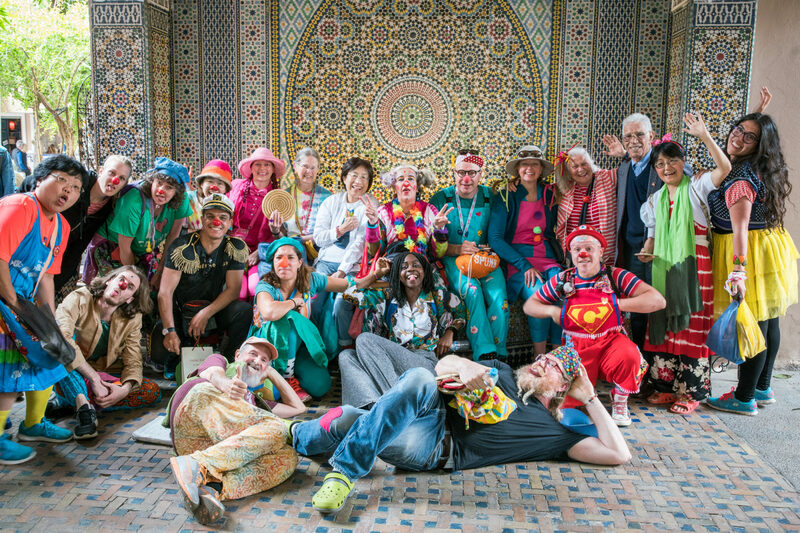 We are looking forward to the next time we can clown in Morocco and until then are left with many beautiful memories. One of our clowns talks about some of his favorite memories below, please take a chance to read about his experience. My name is Jeptha Davenport. This is my fourth international clown trip. It is my first visit of any kind to Morocco and to Africa. I’d like to to share three of the consistent themes I’ve felt in being part of a diverse group of people on international clown trips over the years from 1995 until now. I group these themes into three main threads. First, clowning, is a quick ticket to connect with people, by-passing language and cultural barriers in a flash. Second, clowning is a form of giving to a host country, giving beyond the money spent as a tourist. Third, this sort of clowning creates an extended family, a tribe, for the physical and mental health of the individual. 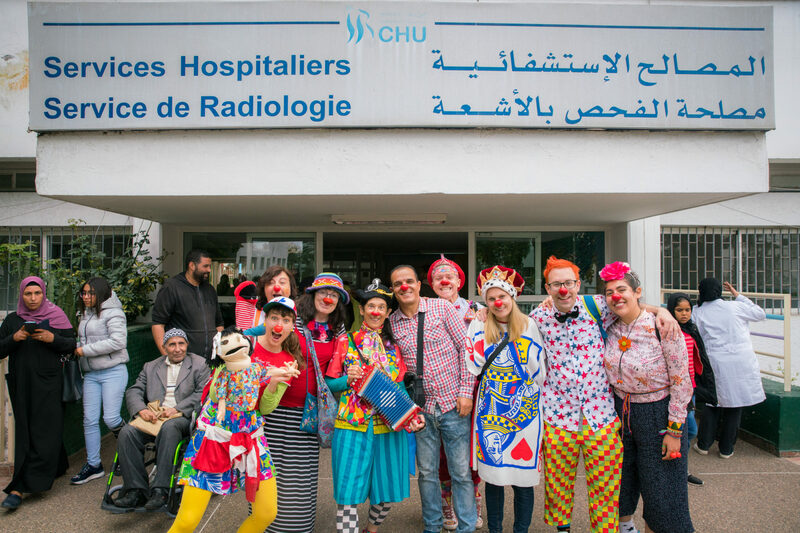 On this visit to Morocco in April-May 2018, we are diverse in age (8 to 76 years old), country of origin or residence (ten), and occupations (some of us are professional clowns, some are nurses, dancers, or visual artists, just to name a few). Quite a few of us are clowning internationally for the first time. If you aren’t familiar with the country of Morocco, don’t be embarrassed, but take a moment to look at a map of the globe and find it. (This is a good habit to get into to be a good global citizen). Look toward north Africa. Not everyone is familiar with the geography even of his own continent. As I was withdrawing some foreign currency in preparation for this trip, I was chatting with the bank teller. The teller was from Nigeria and said “Morocco—that’s not in Africa, is it?” But in fact, Morocco is in Africa. Here in Casablanca, I can walk along the beach and step into the Atlantic Ocean (another clue to finding Morocco). If you live in a city and pass people on the street or at work all day long, you may not notice much about each person or remember them later. Casablanca has a population of 7 million people; a lot of people! (It is the second biggest city on the African continent, after Cairo, Egypt.) But if you pass someone out of the ordinary, even in a big city, it would be natural to be curious. You may make eye contact with a stranger, and if the stranger smiles, you may smile back. Believe me, I meet a lot more people when I smile and say ‘Hello!’ (or ‘Bonjour!’ or ‘La Bess?’) than when I don’t smile. Being dressed colorfully is a reminder to myself to look toward others and be open to meeting new people and to making new friends. When I walk along the streets of Morocco, people often thank me for coming to visit, and they say ‘Bienvenue’—‘Welcome’ with wonderful smiles. When I have visited other countries strictly as a tourist rather than as a clown, it was not my experience to be greeted spontaneously on the street and welcomed. As a clown, though, this happens every day, in Central America, Eurasia, and South America, and now I can say that it happens in Africa, too! For many countries, tourism is an important part of its economy. Tourism can bring benefits but also put a strain on a country’s natural or human resources. Learning about tourism in a country before planning travel can help to make you a more informed global citizen. 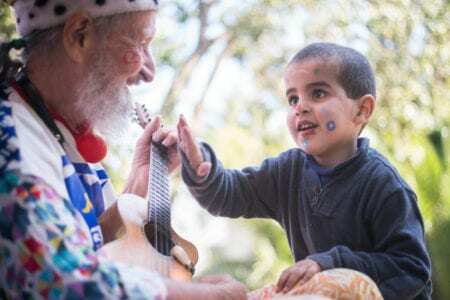 What I enjoy about traveling as a clown is that I have a chance to make connections with people who may be less advantaged, and to offer friendship. When clowning with trips set up through Gesundheit! Institute, I have seen that bonds of friendship have formed through repeated contact (most of the trips occur annually once they are started, with a few exceptions), and many new non-profit groups have sprung up afterward to support people most in need: children without parents (orphans); persons with developmental differences, physical or mental; women in difficulty; men in prison; people who are sick; people who are dying; people without adequate shelter or nourishment. These are all groups that international clowns have worked with. Trading goodwill and exchanging ideas are powerful instruments to encourage peace rather than war, to replace hate with love. One of my older clown friends reminded me yesterday of the hope of her generation when the (United States) Peace Corps started, so that young people from the U.S.A. could travel by invitation to places where they could learn local languages and about the host culture, offering skills and teaching in return, all in order that nations might be brought closer together, if not ending differences, creating space in the world for diversity. When we make friends, we make fighting less palatable. In a country with roughly the same population as Canada, where I’m from, over 30 million, Morocco seems to be growing quickly, but in a paradox of modern life, the more people and the more busy a city is, the more we find loneliness. People can lose connections with others. The travel experience could be isolating as well, but traveling as part of a troupe is an antidote to isolation. Over 40 of us from more than 10 countries are looking out for each other in sickness and in health, and as a group we have collective resources to handle all sorts of situations. From sick clown vomiting in a market flowerbed (that was me), to clown who forgot a credit card in another city (not me), to clown who took a wrong turn, each had help and love from the group, and all was well. It is immensely satisfying to be with people you care about, and who care about you. The late psychologist John Cacioppo spent a career studying loneliness and the benefits of escaping it; meaningful connections with others happen routinely in a tribe. The Canadian Broadcasting Corporation has recently run a series on pitfalls of modern life including an interview with Professor Cacioppo. Our tribe knows how to make space for an individual or individuals who need to focus on a job at hand (planning a route or making meal arrangements or writing a letter or resting and recovering). 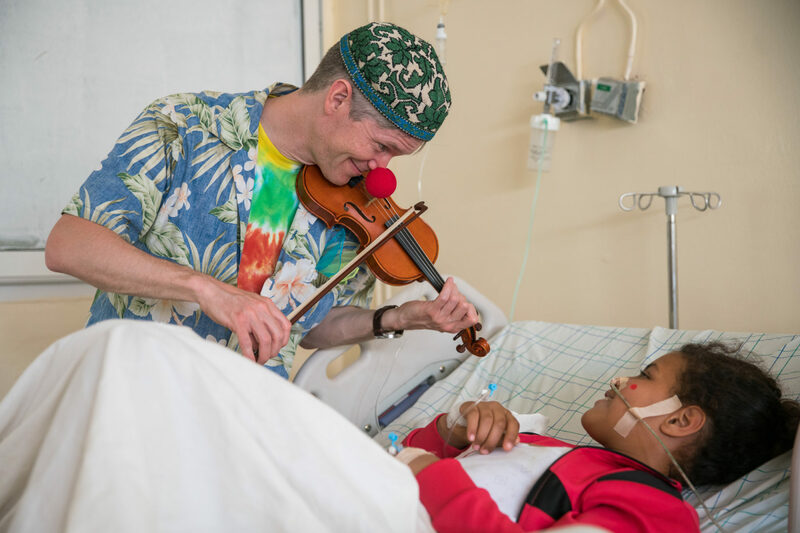 We can be noisy (on the bus, on the streets, in a park, and especially in a school with 200 children), but we can be quiet, as when laying hands on one of us who is facing cancer. Our tribe knows how to laugh and play, to solve problems, to protect; to listen, and to care. What we offer to the people we meet, we offer to each other: kindness, compassion, thoughtfulness. How can a group of people who come together for a brief yet full ten days maintain the benefits of being in a tribe? We use the skills we already have to build more tribes at home, starting with the people we love, and adding on, one smile at a time.